I like this set a lot. To me, the trebles have a perfect level of brightness. The basses complement the trebles well, with a balanced level of brightness. Vibrato is easy on these strings. I also really like the balance of tension. Too often with other sets, the tension drops dramatically from the high E down to the B and G strings. There is a smaller drop off with these. I especially enjoy playing Mertz with these on my Kremona Fiesta FC. Disclaimer: these are my first guitar strings so I have no frame of reference to compare them outside of the cheap ones that come with the display model on my Lucero lc100ce. That being said, I was surprised with the performance and quality of these strings, especially considering they are advertised as low tension. Even my non-musical family members were able to hear an improvement in tone quality. I also like the fact that they are white nylon strings, with the bass notes wound in silver, adding a bright look against the dark color of the fret board. For me, look is just as important as sound, and this delivers. On the down side, I noticed they buzz more easily than my old strings. Making sure they are in tune and adjusting the way I play helped to cut down on the buzz, but I suspect a higher string tension or higher action would alleviate this problem if it becomes too much for you to overcome. These Aquila 97C Light Tension Strings are amazing! I generally use normal tension but find them a bit hard for me....and most light tension strings are dinky sounding.....tried everything..but the Aquila 97C are loud and full and really easy to play..... a fast string. Q: Hello. Could you please help me to find out as follow. I have problems with different E strings (No1) for my guitar with 640 mensur, and have tried several from you. Savarez. La Bella, daddario and others, with "Bad" result. Today I found a "White" string left from a previous general test which suits me. Can it be from a Aguila set off strings, because I tried that once? Yes it is most likely form the Aquila set. 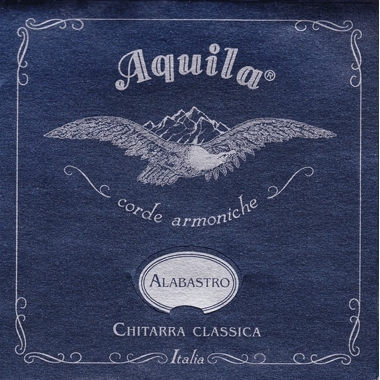 Unfortunately we are not able to offer single Aquila "E" strings at this time. Sorry.